Today's post is the sixth installment of the Cottage Cooking Club a virtual cooking group started by Andrea of The Kitchen Lioness. We are currently cooking our way through the River Cottage Veg cookbook by Hugh Fearnley-Whittingstall. Every month Andrea picks one recipe from each of the ten chapters. We then pick and choose which one or ones we want to blog about in a single post. For the month of October I prepared two of the recipes. The first recipe I prepared was the Cannellini bean and leek soup with chili oil. I started first with the chili oil in which everything was gently cooked together in a saucepan for 20 minutes. When finished; the oil had taken on a golden hue and was quite spicy. A few drops is all that was needed to finish off the soup. Next was the Roasted cauliflower with lemon and paprika. Hot smoked paprika and lemon are sprinkled over the trimmed florets and then roasted. This method sounds very simple and it is, but the flavor is complex. It tastes caramelized and smokey with bits of the lemon popping up here and there. Roasting the cauliflower totally changed this little veggie and brought it to a whole new dimension. The addition of the lemon and paprika is definitely a spice combination that I would use again and again, it is delicious. Recipes adapted from the River Cottage Veg, by Hugh Fearnley-Whittingstall. First recipe; cookbook chapter Hefty soups; Cannellini bean and leak soup with chile oil, page 165. Second recipe; cookbook chapter Roast, grill and broil; Roasted cauliflower with lemon and paprika, page 352. Thanks Tex, it was good. Going to be too hot today for hearty soup but I won't forget this one! Thanks Maureen, this was simple and delicious! I failed at the chile oil, but enjoyed the soup. The roasted cauliflower looks fabulous! I will have to give this a try very soon. I made the Brussels sprouts version instead. Hi Cathleen, your amazing cooking all the recipes that you did, the brussels sprout version looked great. I am so glad that you picked and made two recipes that really didn't interest me. BUT, after reading your Post, I am definitely going to try both of these. I happen to like cauliflower and I make soups all Winter. I think you eat the jackpot on what makes these veggie dishes so delicious - the flavor combos are ones I've never tried or even thought about trying before. Like in the cauliflower when you mentioned that the flavor was complex. Believe it or not, I have never cooked with chili oil! NICE JOB. Thanks Mary, his recipes are so unassuming, so simple. The chili oil was pretty spicy, just needed a couple of drops. Hugh is wonderful isn't he? so passionate about produce and really good food. Hi Sherry, he really does seem to be that way, love the way he cooks. I made both of these and enjoyed them also. Kudos for making your own chile oil - I cheated and used store bought. I agree with you about roasting cauliflower, it really does transform it. Thanks Zosia, having a great time cooking with everyone, can't believe we are already over the halfway mark. Thanks Charlie, roasting seems to really make the flavor shine here. Hi Cheri, the soup seems lovely. So many soups and stews taste better the following day as the flavor develops.Nice touch with the homemade chili oil too! I very much enjoyed the spice pop of the paprika in combination with the roasted cauliflower. I would likely use a bit less lemon next time perhaps roasting in the olive oil simplicity. Hi Peggy, yes, the cauliflower was certainly a nice surprise. This spice combination is wonderful and I will be making again. The soup and the cauliflower both look super great. I love a big bowl of soup when the weather starts to cool down, it's the best feeling! Thanks Pamela, it is the best feeling! The soup looks so good, Cheri, and I'm really intrigued by those flavours with the cauliflower. I can't quite imagine what it would taste like but I just know it would be so unique and delicious! I roast cauliflower a lot and will definitely be trying that next. Hope your week is going fabulously well, sweet lady! Thanks Robyn, roasting veggies is the best isn't it? the week is going great, love this time of year! Hi Shashi, simple really is better, thanks! Cheri, two very yummy recipes indeed - we also loved the soup and the roasted cauliflower is a great recipe to try! So much fun to see that you enjoyed preparing both recipes and participating in the Cottage Cooking Club again this month! Hard to believe that it has been six months already! Hi Andrea, yes time passes by so quickly, so a nice group to cook along with. Thanks for the cauliflower recipe - I will definitely try that soon! I love your recipe club - sounds like fun. 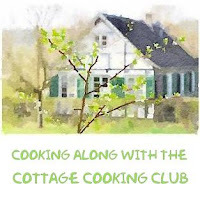 Hi Tricia, the recipe club is a great way to meet people with common interests on line, having fun! I love roasted cauliflowers! Must make some soon. Thanks Angie, it's my new favorite way! 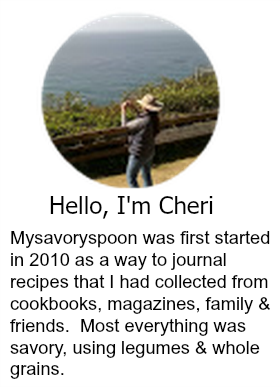 I've seen the soup on several posts, Cheri, but your picture is the one that's got me thinking that I should try it out. I love soup and have some leeks in the fridge. I'm really enjoying all the recipes in this book. Mostly easy and quite delicious! Hi Betsy, yes, this all seem very simple and delicious, something you can easily cook everyday. Great looking dishes. I love roasted cauliflower, but have never flavored it with lemon and paprika. But I will! Thanks. Hi John, it's a very nice combination, one of my new favorites I believe. Hi Cheri , love spicy foods , I will sure try thses . Thanks Nee, to follow by email it's on the top right of this page. The chili oil is delicious, makes extra. Only used a couple of drops as it was quite hot. I have never experimented with cauliflower. Only boiled it. I think 2015 (or what is left of 2014) is going to be my grand experimenting year with cauliflower. Hi Cathleen, good for you, experimenting is great fun, especially with roasting! The soup looks wonderful. I especially like that it leaves you with extra chili oil - I love having condiments to play with. I thought the cauliflower was wonderful, too. It's hard to believe six months have gone by! Hi Teresa, I know, I believe February is the last month, having fun! Hi Tandy, it's a great combination, so simple, but so much flavor. Both of your dishes look wonderfully delicious! That soup looks like perfect winter fare. I will be bookmarking it for later. I also love your cauliflower…it looks delectable! I make roasted cauliflower quite often…and enjoy the texture much better…I usually use garlic and olive oil. I will have to give this recipe a try too! Lovely post, Cheri! Thanks Kathy, we both made completely different things this time, but i will be making the beet tarte tatin. This was a great month. That roasted cauliflower is calling my name. I must try it asap. Thanks for sharing C! Thanks Mike, it was a really simple but tasty combination! Both recipes sound delicious and perfect for the season! I do love the sound of the roasted cauliflower with those seasonings. Thanks Susan, I'm beginning to think that most veggies taste delicious roasted, especially cauliflower. Love this soup!! Looks super flavorful with that chili oil and perfect comforting meal! Thanks Ami, the chili oil was a nice garnish! Both of these recipes sound so good, Cheri! Hi Julie, I really liked the lemon and paprika combination! Damn delicious and comforting dishes!!! Ooo I must try preparing my cauliflower that way!! Hi Joanne, it's the best! This soup looks so delicious, and I love roasted cauliflower! Hi Marcie, I do too it's my favorite way! Thanks David, we really enjoyed them. How perfect for a fall dinner. What kind of paprika did you use? There's such an amazing range, and I love them all. I most love the smoky ones. Hi Susan, I used smoked paprika, recipe uses hot smoked.